I have put my fan to auto and have instaleld a button inside cabin to make it direct incase i see overheating. The temperature sensor was changed. How is experience of you guys with auto fan ina a 2004 or pre model and at what temp does the fan kicks in? And what do you see wrt heat inside engine bay? Better if you take your car to an authorized workshop to do it. Local mechanics can never set them perfectly. usually fan turns on when temp gauge hits the middle, engine bay remains heated specially in summers. but in winters as i live in comparatively colder parts of country to hamari gari sirf traffic jam ma garm hoti or jaisay highway py ao to needle 25% sy be neechay ajati and stays there. Your engine needs a thermostat valve. Then ur needle will remain at middle position all the time. Thermostat valve was there, and fan was auto but i never had any issue in pickup r anything was having mileage of 13 km/L in city with A/C. still missing my Baleno as i have given it to my friend, and upgraded to civic-05. life surely has become a lot more peaceful. do u have made this modification using simple grounding technique? or by using a relay? i am also thinking to sale baleno and buy eagle eye civic. please tell how do u compare both cars in comfort, fuel economy, ac performance is hot summer, and maintenance point of view? i have heard that eagle eye civic spare parts are available but very costly. Nauman actualy i bought it form my friend so it saved me hassle of checking it and not end up buying a lemon. because an abused HOnda Will bleed money from your pocket any way possible. SO first thing is buying the one in good condition electrically and engine wise. Comfort: no one cant compare comfort of Baleno with Civic. Civic-05 is miles ahead of it. Fuel: i am driving civic with very Light foot so i am able to have around 13km/l average in ISB. Spare Parts: yes there is a price difference, but that's justified for given addons u get and comfort u get out of civic. Heater & A/C much better in comparison. 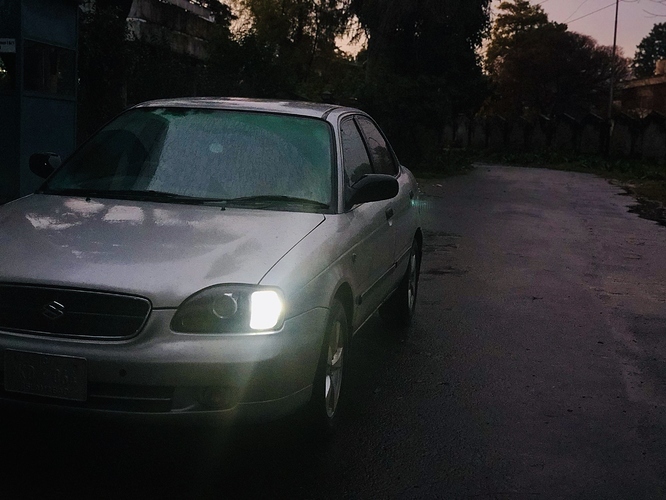 Brother my Baleno engine is getting week.. so tell me a good machanic who is master of Baleno and should be in Lahore.. I have Suzuki Baleno 2005 model with me. The problem I'm facing right now is that it jerks in lower gear. On top of that if AC is switched on then start jerking a lot. So, I visited my mechanic and got my coils checked and he found it faulty. So i replaced it with the new ones along with the plugs. But the problem still persist. Please let me know if you have any solution to this problem. Kdhar se len coils?agar masla hal nae hua tha tou phir use waqt wo coils wapas kyun nae ken aur us so called electrician ko bolna tha na k bhai masla wahen ka wahen hai? Masla petrol par hai ye ya cng par? Jerking he hai khali ya backfire b hai? I bought it from Shakil autos here in lahore. Aur mene jo pehle coils li thi qabli woh wapis karwa k dubara change krwayi thi kyun k pehle wali mein masla tha. But jb yeh wali bhi lagayi toh masla solve nahi hua. Petrol pe hai car jb se mene purchase ki hai is se pehle ka mjhy idea nahi. Could be because of the bad fuel pump. You can get that checked too if you haven't before. In lahore you can visit Osama for the diagnose, in tipu block Garden town 03214106898, this number has been provided numerous times on Pakwheels by car gurus. I also own baleno and had the same jerk problem, after changing multiple other things the culprit was fuel pump.